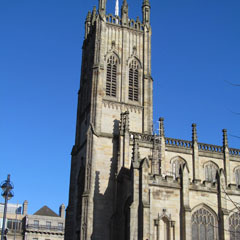 In 1818 the growing episcopal congregation of Charlotte Chapel, Rose Street, built a new church, St John’s, on the corner of Lothian Road/Princes Street. Its wealthiest members at the time, Alexander Tod, East India Company captain; his ex-deputy, Thomas Robertson; Alexander Dyce; John Downie; and Alexander Falconer, all made fortunes in India. A memorial window (number 9) is dedicated to George Swinton, by 1833, top civil servant in India, from where he sent important scientific specimens, from elephants’ eyeballs to first samples of Burma crude oil to Edinburgh. Four of his sons served in India, three dying on active service. 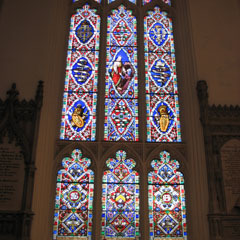 The George Swinton Memorial Window. 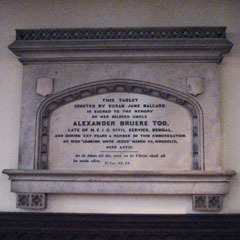 Memorial to Alexander Bruere Tod, HEICS.